At the outset, keep one focus in mind, just grab whatever role or acting assignment you get at the earliest, and don’t be choosy. Remember you are a struggling Artiste (who isn’t? Bollywood is filled with strugglers at their respective level), the year has just begun, your life needs work to gain momentum, it’s like you have to take a step back to jump four steps ahead. Keep this as a prime rule, you need to be busy and having a work in hand will keep you busy and will be a springboard for more work to come. My experiences state that ‘the way money makes money, similarly work brings in more work’ nothing gets into trajectory mode if you aren’t ready, any assignment in hand will get into the trajectory mode and will keep you on-your-marks to get-set-GO! It’s an old adage, rejections are part of growing period in any struggling moments. Remember they haven’t closed the door on you. Mithun Chakraborty graduated with a Diploma in Acting, in the year 1974 and fresh out of the FTII Pune (Film and Television Institute of India), started knocking the doors of the film producers. As most of the film producers offices were located within film studios, just imagine the plight he was told to return back from the gates of the studio. Now, this is something you can’t tackle, watchman or a security guard has nothing personal with you, he is just doing his job of obstructing unknown people and aspirants. One incident about his struggle brings up into the foreground as he had highlighted in an interview of a Stardust magazine published in the year 1984 which is as follows --------[[ The moment he graduated from the Institute. Mithun began to feel insecure all over again. The uncertainty of making it in the Industry frightened him again. The struggle had started, so had the barbs and insults. Once when he approached a producer with his photographs, the man looked at him from top to toe and sneered “the Industry has sent so many gadhas, the biggest of them has come now”. If Mithun could never forget this, he could also never forgive one particular filmwalla who abused him in front of a whole lot of the industrywallahs when he threw him out of his office with. “Try Devar Films, they train animals there, you might stand a chance there. I can’t help you, for right now, I’m making films with human beings”. Mithun was almost in tears “The producer was not insulting me at that time” he explained dispassionately now “His disgust was towards my low status. I have realized that people don’t respect or humiliate you for yourself but for your position” ]]. More struggles for Mithun happened dotted with ridicule, humiliation, barbs, stopped-at-gate, shown-the-door etc….many movies later, the year 1982 saw the release of a titled ‘Main Aur Mera Haathi’ with him playing the stellar role produced by Devar Films, a one of the known production house from South India, which turned out to be a good movie.Struggle and Hard-Work paid off, you see nothing is personal, all are related to professionalism and it also states that you have been at a right moment in a right place and at a right time all through right connections. A bit of hard work, luck and right connections make a perceptible difference. Every Friday, post the outcome of the new releases, sets in a game-changer which is the effect of a complicated set of power dynamics involving audiences, trade analyst, Bollywood pundits, Social media reviews, Industry reactions and other unknown factors plays out. The thinking of power player’s changes and this impacts the industry on the whole. Even the acting aspirants have to change accordingly and deal synergistically as they have to audition for the people with the power, the money, and the creative control so when you walk into an audition room, you don’t think you have the power. But that’s where you’re wrong. It’s true, casting agents are the ones making the decisions but they are incapable of bringing their vision to life on their own; they need you. They need you to elevate their script and help them fulfil their vision so they can keep their job on this project and be granted permission to create again. And they usually need it on a deadline and you have to make sure that you deliver within the deadline. If they don’t get it, their production can’t move forward. Often times they’re terrified (even if they don’t show it), sleep-deprived, and trying to keep a thousand plates spinning as the stakes keep on growing with time. When beckoned, you enter confidently, illuminating the room with your presence and keep charged the crew with your conviction of the character, and this will keep them satisfied as they just need you to be a talented actor. If you’re able to do that, you have all the power. They have a need and you have the ability to fulfil that need. The outcome of an audition is fulfilling the film-makers requirement and that is all that matters. Fame, popularity, being in page 3, riches, known among the social-circles, and high-end representation are often perceived as indicators of talent. But it’s not always the case that the rich, popular, Jubilee-Stars, famous, well-agented actor is the most talented or the actor who can deliver that talent at will. So forget all that stuff. Sure, it’s a potential indicator of value but it’s not the value itself. You’re a talented actor and yet to prove you’re potent. They’re in need of a talented actor. So you have power derived from you ambition, aspiration and drive. Don’t let anyone tell you differently, even if they tell you, as they are in the dominant position for time-being, there could be a message, kindly decipher and take it as a lesson, not as a discouragement. Power and talent are interlinked, however, having power is different than feeling powerful. You can logically understand the power dynamic happening in the industry but it’s another thing to hang on to your power while sitting in a waiting room with pages of dense dialogue swimming around your head, about to read for a fancy showrunner who can give you a career and recommend to someone who can consider giving you a break. Preparing to be a star or a known star is different from being every ready actor-performer. A good actor cannot perform if he is not ready or not in a mood to perform. 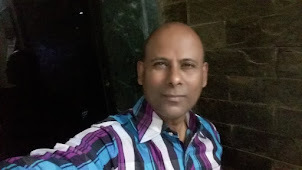 So always be a keen observer as a learner who is referring notes and be free to learn by observing and taking time to know what syllabus is important in order to be a full-fledged ever ready actor-performer. The most freeing thing an actor can know is that power is a practice and re-practice till you get a proper feedback of doing perfectly. Feeling like you deserve to be in a big audition room is the product of practice and perseverance. If you practice your art on a level that rivals the training of an Olympic athlete, you minimize the feelings of powerlessness. You want to be in those high-pressure, deadline-fulfilling moments and high-stakes rooms. So lift whatever weights you need to in order to ensure that when called upon, you can deliver that amount of material with ease, perfection, finesses and clarity, bringing the fullness of your unique emotional life. The power is in the doing and fulfilling within the timelines. Yes, doubt, irritation, awe and nerves will creep up in high-pressure situations. But from a foundation of consistent, dogged exploration of the work, your talent will fight through. Confidence in aspiration and willpower to remain moving will definitely come if you completely believe in the talent you possess as the Almighty has chosen you for this path. And always think that you are the chosen one and your super talented in this field and can offer that talent boldly with ease and expertly, you have as much power as anyone else in that audition room. When you walk in with talent, the power dynamics turn upside down as you are nearing your destination because they need you, your hard work, and your emotional investment. All you have to do is be a great performer in that room and that comes from an artistic practice, from doing the work you love that emerges from your passion and remain passionate about this profession. Now is the right time, it's now or never, this reminds me one of the dialogues of Sanjeev Kumar as the character of Thakur (one of his stellar performances) in the movie Sholay, he delivers “ Loha Garam hai….Maro Hatoda”, let this be your maxim for the year 2018. Think bold and audition confidently, as if this is the only way to evolve and try to continue doing much better than the last audition. Dear Bollywood Aspirants this is the perfect time for you—an actor with immense talent, unrestrained stake and with so much to value-add to the growing Indian audience and to the film industry—here is the time to commit to owning your power and bringing the totality of your power to bear-on-stage, on set, in the audition room, illuminating the screen and in your life. This is the year of your power to unleash your talent to etch the minds of the entertainment-starved audiences. 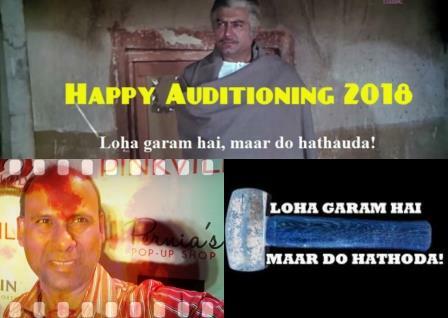 Happy auditioning 2018!.